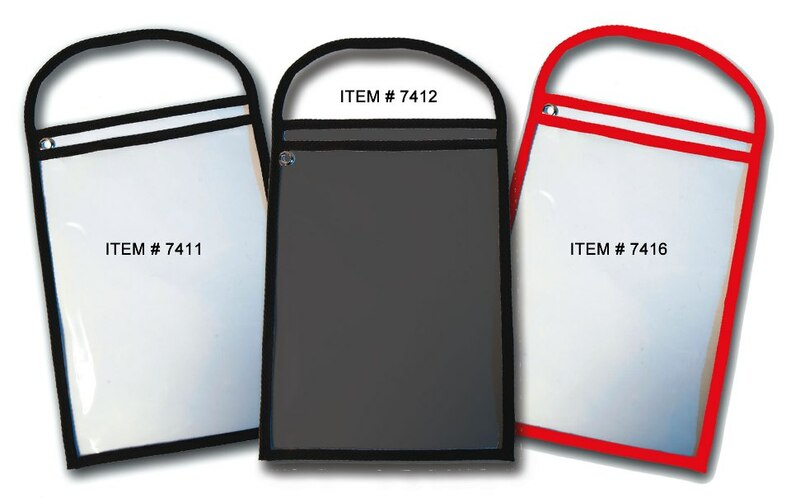 Item Size: 11" x 13"
Our Repair Order Holders Sleeves come in 3 styles to choose from. These reusable sturdy sewn cloth and plastic repair order holders will keep your work orders clean, neat and organized throughout the job. Large loop handles make it convenient to hang them from any antenna or mirror. Each also has an extra-large grommet so that it can be hung from a hook. This strong grommet is well-designed and attaches through the backer so it doesn't interfere as you slip your work orders in and out. #7411 - Clear on the front and back; with handle and opens on top; size 11" x 13"
#7412 - Clear on the front and solid on the back; handle and opens on the top; size 11" x 13"
#7416 - In RED with clear front and back; with handle and opens on the top; size 11" x 13"
COMPARE OUR PRICE to Great American Automotive Products. THEY'RE MORE EXPENSIVE … American's Price is 25 qty @ $216.25 (ROH29BLA). Ordered work order sleeves. The customer service was outstanding. The item I ordered and received was accurate and timely. Thank you. GREAT Fast shipping and great products. Found the pricing to be much less expensive than other companies I researched, without giving up quality. Have used them for several years.